Peeking behind the curtain of President Obama's announced "pivot to the Pacific" we see the U.S. military operating in that region over the long haul. From the gunboat diplomacy that forced Japan to open its markets to U.S. commercial interests in 1853-4, and the nuking of Hiroshima and Nagasaki in 1945 followed by the Marshall plan, to the imposition of an enduring military footprint (the largest outside the U.S.) we see our tax dollars at work. These public expenditures make way for corporations like General Electric -- which has paid no taxes for the last five years -- to sell nuclear reactors to Japan, including the Dai-ichi reactors that exploded and melted down following the earthquake and tsunami of March 11, 2011 (aka 3.11). Some citizens are aware that U.S. Navy personnel present off the coast of Japan near Fukushima during 3.11 are suing TEPCO, the company that operates the Dai-ichi plant, for $1 billion in compensation for illnesses they have developed. Eyewitnesses say the ship was several miles off the coast of Fukushima in a snowstorm when a warm cloud with a metallic taste enveloped them. The 71 sailors, most in their 20's, cannot by law sue the U.S. government for damages; their health symptoms include leukemias, random bleeding, thyroid troubles, polyps, and the loss of a testicle and an optic nerve. Radioactive waste water continues to flow into the Pacific as you read this sentence. Enter the Freedom of Information Act. "Mobilizing Nuclear Bias" in the Feb. 17 issue of the Asia-Pacific Journal: Japan Focus lays out who knew what when based on research by Kyle Cunningham, including information obtained via FOIA requests he filed. Cleveland also conducted "in-depth interviews with diplomats in foreign embassies, military officials, journalists, nuclear scientists and scholars." What emerges is a picture of Japanese government officials, mainstream journalists, and U.S. diplomats scrambling to cover up truth at the expense of getting people to safety. ...in the first few days of the crisis, with little meaningful information being provided amidst the disorienting impact of the earthquake and tsunami, and TEPCO offering assurances that were uncritically passed on by the government and a docile press, hope remained that the situation could be brought under control. This wishful thinking was soon made irrational by the explosion of the outer containment structure of reactor #1, which was so powerful (the explosion broke windows 3km from the plant) that both plant workers inside the Daiichi complex and nuclear experts watching from afar initially believed that the reactor core itself had exploded. In the first few days of the nuclear crisis the information made available to the public was confusing, contradictory and frustrating. Despite a massive explosion that destroyed the outer, secondary containment structure of the Daiichi reactor #1 building, soon to be followed on the next day by a similar explosion of the reactor #3 building, TEPCO insisted that the primary reactor core containment was intact and that there were no releases of radiation that posed a threat to public health. Initially, conjecture held sway, with the foreign media challenging the Japanese press corps, who did little more than pass along TEPCO's announcements, essentially serving as a PR agency for the utility. Unfortunately, we in the U.S. are all too familiar with corporate media serving in this capacity for wealthy corporations and their public servants. The U.S. Constitution guarantees freedom of the press, but declines to say how that is to be achieved when money controls communication channels. Japan, taking no chances, passed a highly controversial State Secrets Law in the wake of the Fukushima disaster. And as we have seen in debates over climate change, or the effects of genetically modified foods, science takes a backseat to crisis management when there are profits at stake. ...while the media debated the relative chances of a meltdown and quibbled over the nomenclature, the nuclear experts who worked the crisis knew early on unambiguously that the Daiichi plant was in deep trouble. Cunningham reports that U.S.military officials early on began gathering their own information and acting accordingly to protect their own interests. Social media outlets such as Twitter became important sources of scientific information as TEPCO and the Japanese government continued to minimize threats to public health. Expatriates without official connections were on their own to face decision making in a chaotic vacuum, with vastly inflated airline tickets costing up to $20,000. “Fly-Jin” (a contraction variant of the Japanese word “Gaijin,” a derogatory slang for a foreigner)...were accused of using the crisis as an occasion to take a paid holiday while waiting out the crisis. This label had originated on Twitter feeds as a sarcastic pun, and came to be used more generally to describe foreigners who had abandoned Japan out of fear for personal safety. Japanese citizens, meanwhile, in some cases evacuated directly into the radioactive flume due to a lack of accurate information from either TEPCO or their government. 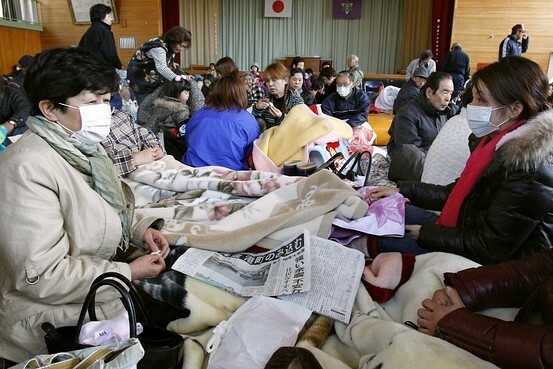 Residents of Namie near, who evacuated into the path of the plume. Mayor Tamotsu Baba has criticized the Japanese government for failing to communicate about how best to protect public health during the nuclear disaster. Also, diplomatic relations with Japan were seen to preclude the sharing of information that foreigners had access to and were acting upon in moving their own personnel to safety. ...it took considerable finesse to implement procedures out of line with the Japanese official response while seeking to avoid the diplomatically troubling insinuation that these policies were an implicit critique of the Japanese government’s crisis management procedures. Information wants to be free, and Kyle Cunningham has shared a lot of it. Too late to be of much use to people living near Fukushima, but that's not his fault. If, like me, you're interested in the management of information for profit, it would be well worth your time to read the whole report.